Last week was another whirlwind of activity on the farm…we did a lot of bed prep which included pulling clumps of vetch and rye, side-forking and raking beds. We had an awesome tool safety demo that covered not only how to be safe with the tools and each other, but with our bodies when we use them. 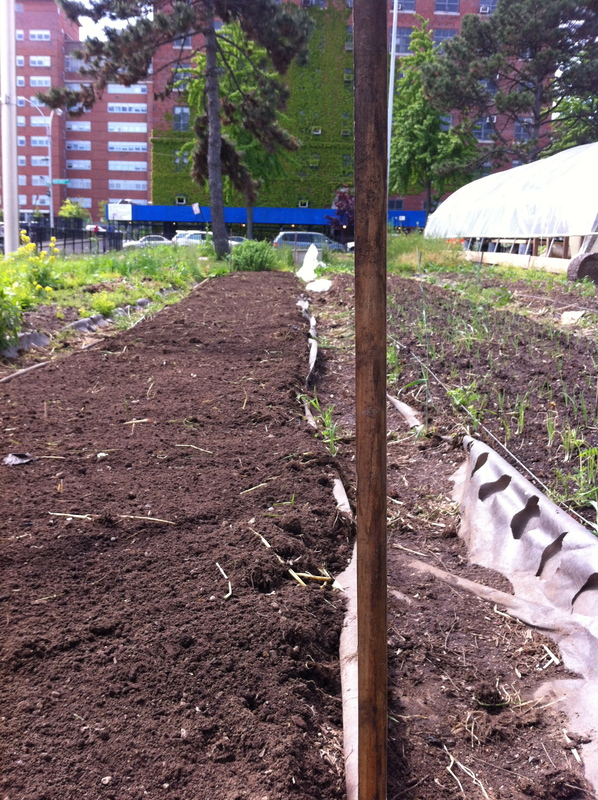 We also focused on how to weed and transplant quickly and efficiently without hurting your back. When you spend lots of time bent over and looking down, your back lets you know it. I’m a big fan of keeping my back happy, so I paid close attention to this part! Students are paired up and assigned a month-long rotation in each area. The first week of your rotation you are instructed…the following two weeks you run that rotation yourselves, and the final week you teach the next two people coming in to take the rotation over. The rotations are staggered so that you’re able to do this. I really appreciate the chance to have to show someone else the ropes – having to teach someone else how to do it really reinforces learning for me. My rotation for the next month is propagation, and what perfect timing! There are still plenty of seeds to be sown. I’ll be spending a LOT of time in the hoophouse, not just filling and planting seed trays, but also watering everything. In the hoophouse we need to check moisture levels every few hours. Those seed trays and seedlings really can dry down that quickly on warm days. We’re in there first thing of the day, last thing of the day, and several times in between, pushing our fingers into the bottom of seed trays and pulling out seedlings to see if the bottoms are moist. We have had a lot of instruction and discussion about proper watering techniques. We’ve learned about the importance of avoiding compacting the soil, avoiding creating a “crust,” what levels of “dry down” certain plants like or can handle, and the importance of even, consistent watering. Every Friday afternoon we have a workshop, and last week’s focus was irrigation. I found it really helpful to talk about the roles and functions of water, and why plants need water. Honestly, I was amazed to find out how many jobs water performs for plants, and in how many ways! It’s pretty incredible. More on our Irrigation Workshop at the end of this post, but first – some photos. 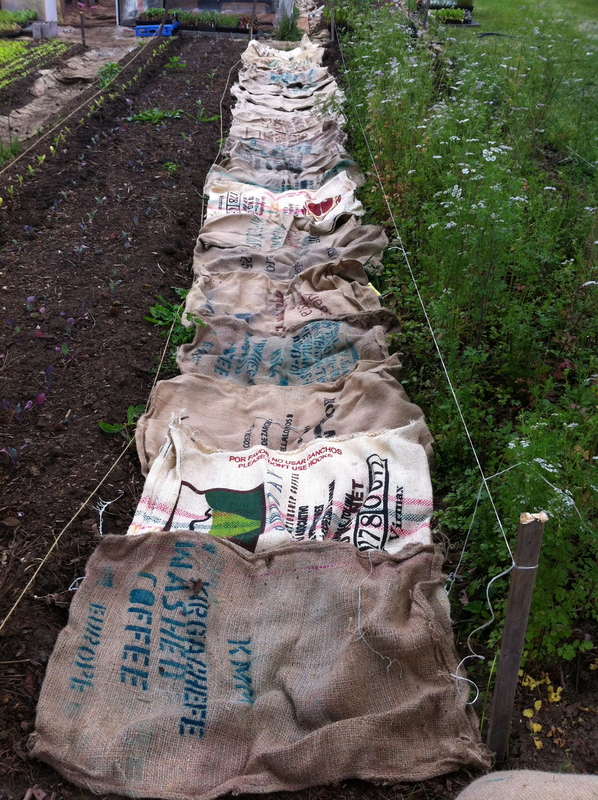 The farm gets burlap coffee bean bags donated from a local roaster…they make terrific path liners between beds! 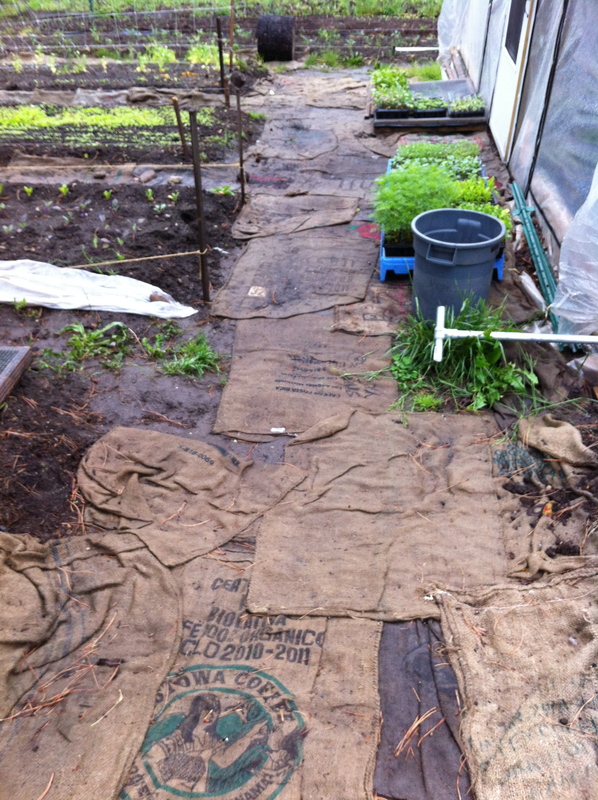 Here’s a new row of burlap sacks, ready to keep down weeds and stop the aisles from getting too muddy. Here’s what they look like after months of use. They do a great job! A visitor in the hoophouse…wish I knew what it was! 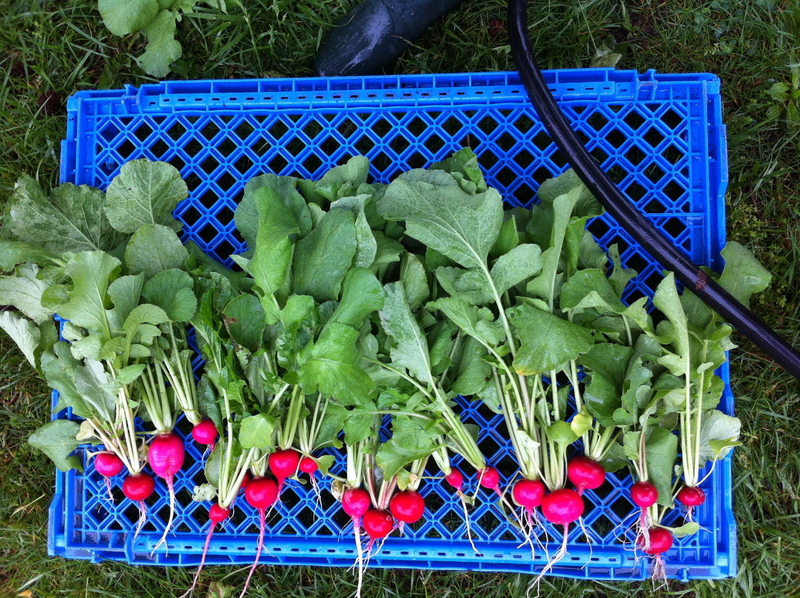 Some radishes harvested and washed for a restaurant order. 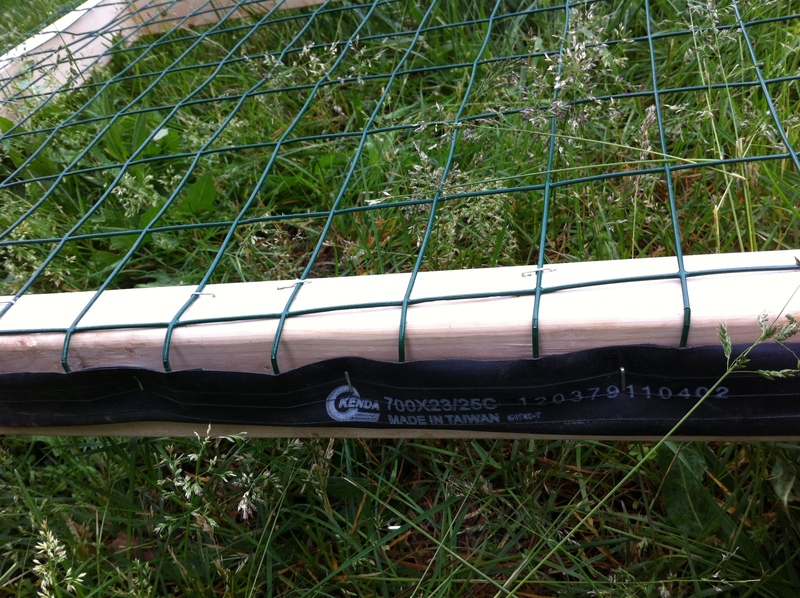 Another awesome idea – stapling bicycle tire tubes to the finished tabletops to cover sharp wire tips! Lots of bike shops have old tubes that they’d be throwing away otherwise. Handy! 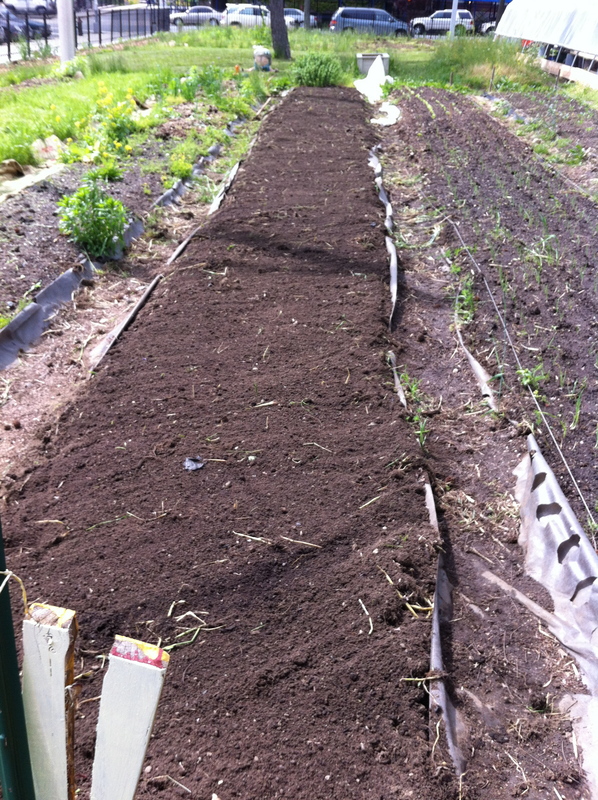 The first bed that we prepped from top to bottom, freshly raked and ready for transplants. Lining up stakes to see if we raked out our 70 foot row fairly evenly. Through irrigation we’re also learning about soil structure and organic matter and how water is lost (through transpiration, evaporation, capillary action, evapotranspiration, and percolation) as well as environmental factors that can affect evapotranspiration: light, temperature, wind, humidity, and soil moisture. 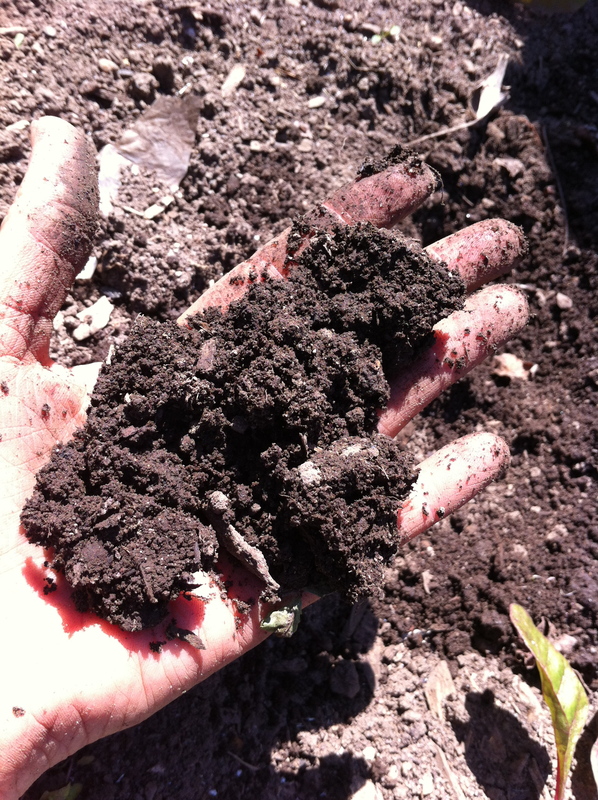 My favorite part of the irrigation workshop was sticking our hands in the soil to test for the “field capacity” of the soil – the extent to which it has reached maximum water capacity. We reached down to the plant root level and brought up handfuls of soil which we then squeezed, examined, crumbled, and tried to make “ribbons” out of – all to determine at what capacity we thought the soil was (according to a chart.) There is an ideal moisture level, for example, when you transplant into a bed, etc. 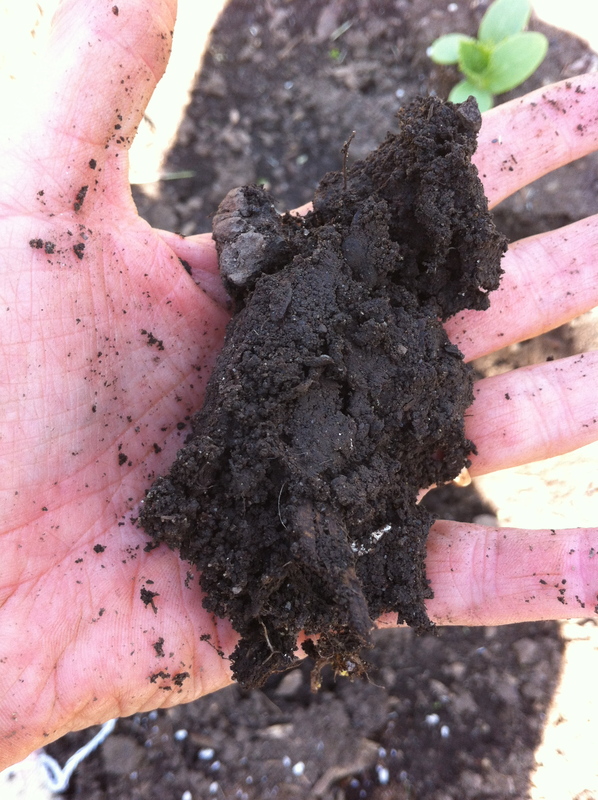 I think we determined this soil sample was in the “75% – 100% Field Capacity” category, due to the way it felt, the way it clumped, the way it broke into large “aggregates” when crumbled, and the fact that we could make a slight “ribbon” by sort of rolling it out with your thumb. Looks can definitely be deceiving. There were plenty of beds that looked dry enough on the surface but were plenty moist when you reached down into them. The surface of this bed looked fairly dry, but squeezing a sample of soil from it revealed it was actually pretty moist – in the 50% – 75% range on the Field Capacity “chart.” We could definitely not make a ribbon with it and it broke into smaller clumps or “aggregates” when crumbled. The farmers say the spend a lot of time every day just testing the soil this way, all over the farm, to determine how long a particular bed should be watered. It made me realize I’ve been watering my plants based on what the PLANTS seem to tell me, not on what the SOIL has to say. Hmm. A bit of a different story since I grow a lot of my vegetables in containers, but still. I’m learning a lot about what else to pay attention to, that’s for sure! 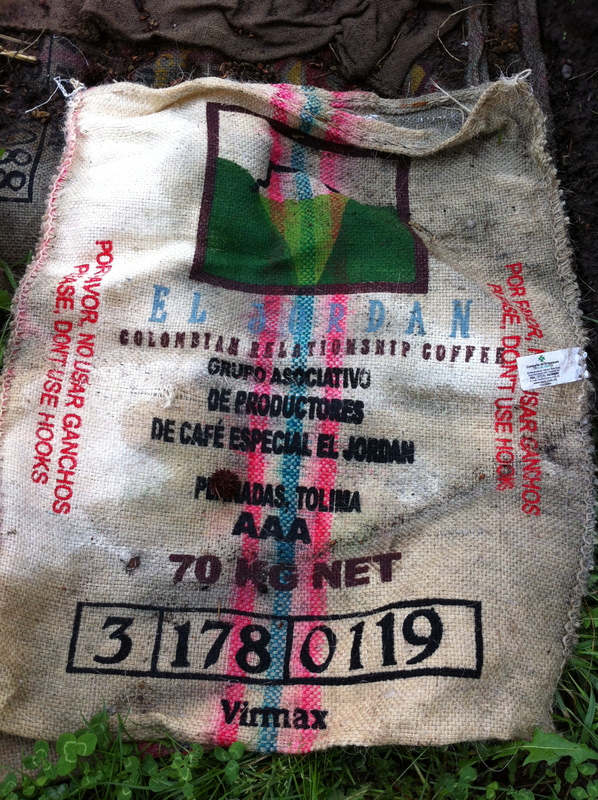 This entry was posted in Gardening, On The Farm and tagged burlap coffee sacks, Irrigation, uses for bike tubes. Bookmark the permalink. ← Hardy Geranium or Aggressive Weed? Your summary of the irrigation pointers is very enlightening! I want to go to school with you. Ooh! 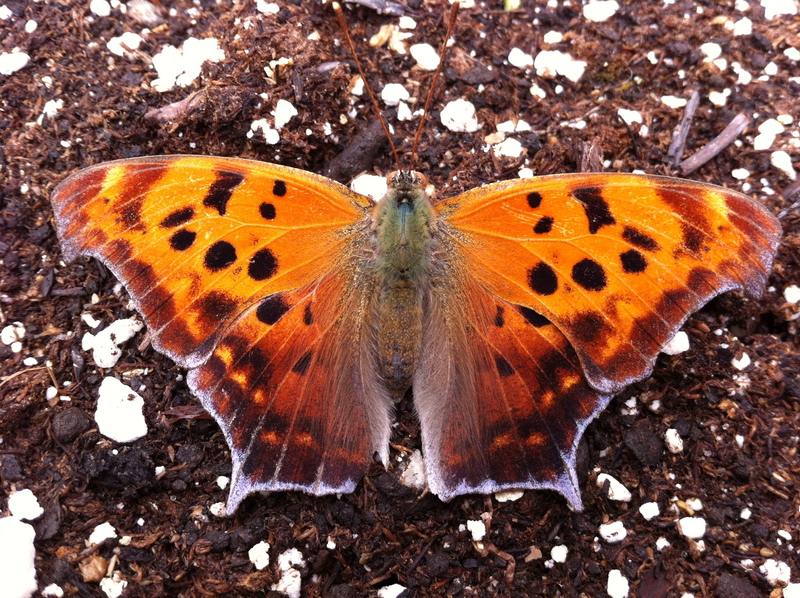 It’s so great to know what kind of butterfly this is – thank you! I’ve shared your info with my classmates. I can’t wait for the next time I visit home and see you to show you all my notes and fill you in even more on the Farm School! Are you gearing up for plant sale #2 yet? OMG, that is all I am doing. It’s coming soon, hopefully before Memorial Day Weekend. I need the little tomato seedlings to jump up high and strong and then all systems are go. There are still several sets of perennials on the list to come out of the ground. I have been digging every single day, shooting for at least 20 pots per day. I think my totals are near 750 right now. The last sale was 801. Some pots were seeded, like 4:00’s or Cypress vines, but the vast majority were divisions. Today I teased apart a Strawberry Geranium (aka Mother of Thousands), hardy outside year round, and got 15 sections from one 8″ sunken pot. I was given a large clump of an unwanted, big-leaved, attractive hosta with 3 shades of green variegation, saving it from the dumpster, and took a confiscated parolee knife to it, yielding 18 sections plus one large piece to keep for my own garden. I just love doing this! Customers are so happy when they see the bulging platforms loaded with affordable plants, it gives me a thrill. But it is all-consuming, kind of like Open House at school. Right now Brian is doing the dishes and I am sitting just long enough to digest my dinner before I run outside again. Jasmine patrols while my head is bent down over the potting station. Amy, I continue to be super jealous of this adventure you’re having! Somewhat unrelated, I’m gardening in containers in my back yard for the first time — some tomatoes, peppers, herbs, strawberries…and I’m wondering what you do for fertilizer in your home garden. I want to garden organically, and I purchased some blood meal which was labeled “organic” but frankly I’m a bit suspicious because it is miracle grow brand, and because I really haven’t a clue what I’m doing. I fear I’m already at a major deficit because I bought Bonnie seedlings (which I do not think were organic, but the website at least says that they don’t use GMOs which is good at least) and I didn’t buy organic soil (I just used some bags of generic topsoil that we had leftover from planting the prior year’s flower pots). I’ll take any advice you want to throw at me! Thanks! Hi Sara! I also grow most of my food in containers – how great that you are giving it a try! It’s very rewarding – literally. I try to steer clear of anything made by Miracle Grow, “organic” or not. I’m just not a fan of them / what they do as a company. At home I use a brand called Neptune’s Harvest – they make organic fertilizer from fish and from kelp. I buy the small (quart) bottle of liquid FISH-SEAWEED blend. This makes up to 32 gallons of fertilizer, (when mixed with water) which can be sprayed on leaves as a foliar spray for some plants and/or used to water the soil. ALWAYS dilute it with water – directions are on the bottle. I’ve noticed that the Farm also uses the same stuff. Food grown in containers definitely needs a little nutritional boost now and then as nutrients can wash out of the container. This bottle cost me around $17 at my local garden center and I think it will last quite a while for a small backyard container garden. Good luck! I’m glad you got some GMO-free seeds! Happy gardening! Thanks so much for the advice, Aimee! Wow this is amazing and again I am so jealous that we have no program like this up here…but I am learning lots from you…just wonderful!!!! Ah, Donna, I am jealous of you living up in the country! But I am definitely grateful that while I am stuck in the city I can at least be involved in terrific programs like this – it really is amazing. Aimee, I’m soaking up (ahaha) everything you say about irrigating. It’s obviously hugely important out here and something I’m thinking about more and more all the time. Those radishes are practically luminous. I’m so glad you’re having (and sharing) this experience! You are learning so much and doing a great job of sharing it here. The burlap bags are a nice idea. 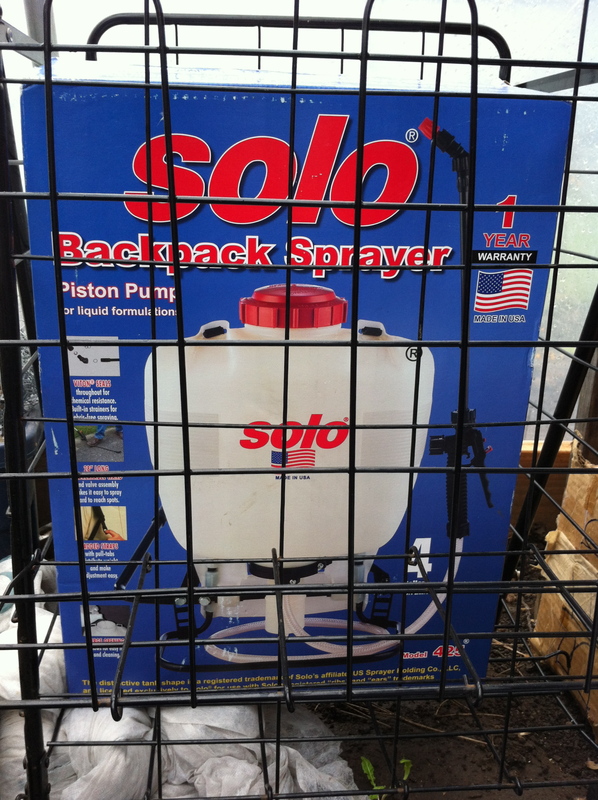 Funny about the sprayer pack. I am enjoying following along as you work through this project…. and learning so much! I’m interested in possibly doing some advertising on your blog. Can you please email me at: vanessareed@boamail.com.